We in the United States have every right to complain about taxes (also known as "theft"). But the French have it worse. So much so that the anti-tax protests in recent weeks have turned violent, and Socialist French President Francois Hollande may well be more hated in his land than Barack Obama is in ours. I personally visited Paris twice last year: once before and once after Hollande took power. I saw more homeless Parisians and street-hustlers, and a meaner spirit to the city on the second trip. This is anecdotal and not a scientific measurement of the effect of a Socialist regime, but it seems to match the news coming from France. For background, a few relevant points about Liz Greene's chart for the Fifth Republic, considered to be the current "chart of France". We might go into some other aspects of this chart in the future. Pallas/Ethics: On the authoritarian side, Pluto is widely conjunct Pallas and novile her ruler Mercury. On the libertarian side, Pallas is parallel her ruler Mercury, which in turn is conjunct both the North Node and the Sun. So while there is an astrological impetus towards a strong central government, the country also has a significant and probably growing libertarian streak. Venus/Second-House/Economics: Venus happens to rule the Second House in this chart, so she is doubly strong as an indicator of economic leanings. She is, within mere minutes of arc, in a semi-sextile with Neptune. On the other side, she is semi-sextile Pluto, forming a strong midpoint picture. Wealth, as represented by Venus, is colored by dissolution (Neptune) on one side and destruction (Pluto) on the other. In addition, Neptune is conjunct the North Node. Combined with a not entirely libertarian Pallas placement, this explains the nation's strong and increasing Socialist tendencies. These configurations reflect France's Socialist bent, and also some of the internal opposition to it. The same chart, with current transits and progressions, describes the tax revolt situation. 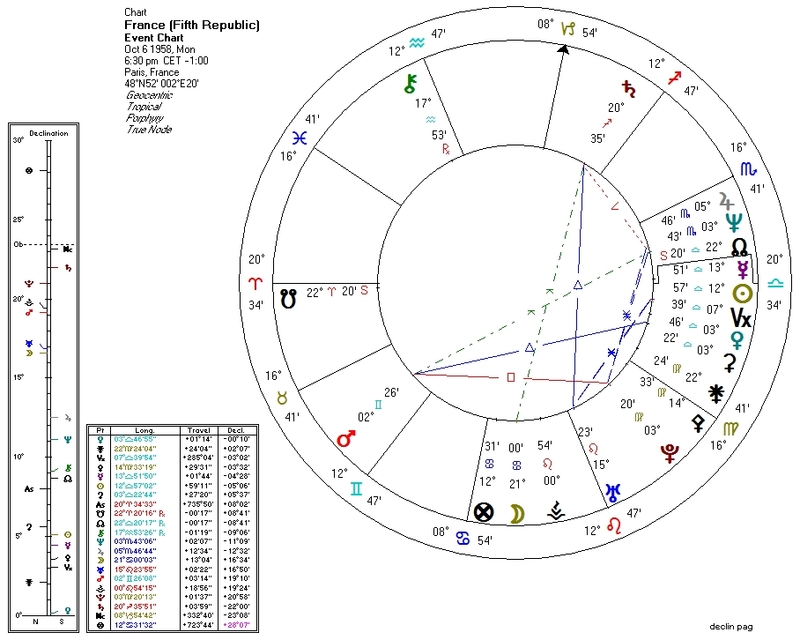 Transiting Pluto conjunct France Midheaven: revolutionary pressure to change or topple the regime. This is just the beginning of interesting times for the government. Transiting Neptune opposite France Pluto: dissolution and/or general disillusionment regarding the political/monetary power. Transiting Saturn entering France Eighth House: years of struggle regarding the tax system lie ahead. 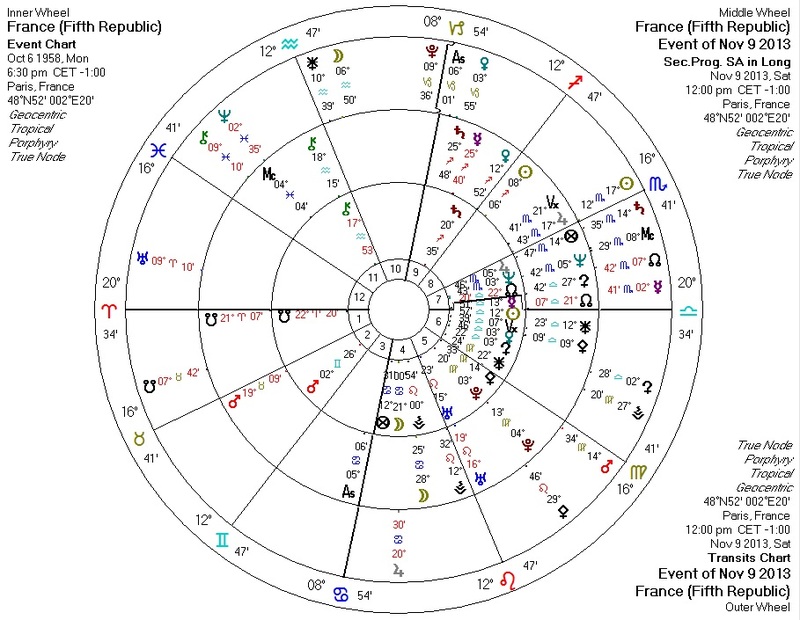 Transiting Stationing Jupiter conjunct France Moon in the Fourth House: a popular (Moon) movement (Jupiter) against (Fourth House, representing the opposition to the ruling party). Jupiter is retrograde now but will be coming back for another run. Progressed Mercury Station conjunct Progressed Saturn: Mercury, ruling the Sixth House of the workforce and general populace, stationed retrograde earlier this year. It is now moving away from progressed Saturn (traditionally ruling authority). France has historically been an inspiration to America and her political movements. We might do well to keep an eye on our long-time European partner, to see what awaits us here.